One year ago, the 2012 European Space Elevator Challenge (EUSPEC) was held in Germany, at TUM Campus Garching. A “highlights” video was created, which the EUSPEC team posted on its website. They recently re-announced it and it makes fine/fun viewing. You can view it here (Post by European Space Elevator Challenge (EUSPEC)) on Facebook. It has now been almost exactly one year since the last European Space Elevator Challenge. Take a trip down memory lane with this little video which was so far buried on our website. We are hoping to bring back EUSPEC for 2014 or 2015. Stay tuned for any news on this site! This entry was posted in News / Announcements, Space Elevator Competitions on October 30, 2013 by Ted Semon. Recap. We have flown 3 previous times. 1 hr, 2 hrs, 5 hrs. First run failed because the laser aim was out of adjustment. Second run failed when drone lost track of it’s bottom target and drifted into the wall causing crash. Third run failed when we moved our broadcast system and interfered with the Drone comms. They’ve also had some “environment” issues (had to partially open some shades to create better airflow) and they think that the simple act of people walking around was causing an issue. They’ve pretty much stopped that now and things are very stable. As of this blog post, they are about 3 hours into run #4 and, if all goes well, they hope to eclipse the old mark of 12 hours and 27 minutes about 4:12am, Sunday morning, CST. You can view the live broadcast and participate in the chat session by going here. This entry was posted in News / Announcements, Space Elevator Competitions on September 28, 2013 by Ted Semon. “Today, I would like to introduce to you our new category SE climber activities. It is called SPIDER from it’s characteristic, right weigh, speedy, smart(will be). – Easy to build ( but not too much easy) : Builder must work with drill and jig saw and file. EST to finish by high school techie student is 30 hours. – Safety awareness : Builder must study and think about dropping provision and safety mechanism with break. Those are very different point from other robot building activities. – Automation : I t is very easy to change RC receiver to micro computer like Aruduino. On June 8th, we held a mini-race with collage and university students. 8 climber came and 4 climber succeeded to climb in almost 10km/h ascend speed. I would like to ask you to introduce this kind of activities on you blog. It is not so difficult to build a smart climber with RC kit / parts of recent-day. Important thing : Energy of recent battery and power of motors may cut the belt very easily if tire/roller run idle much. Please consider to use the heat-stable material tether/belt. In Japan we strongly suggest to use aramid fiber belt. Before you climb, please do the run idle and tether cutting experiment. This entry was posted in News / Announcements, Space Elevator Competitions on June 19, 2013 by Ted Semon. Regarding the Climber competition itself, there were certainly no new Engineering principles at work here – they were robots, assembled from a Kit. I have posted a video of one of the competition runs at our new channel on YouTube: ISECdotORG. But the whole idea of the BEST competition, as I have written about earlier, is to encourage middle-school and high school level kids to get interested in techie stuff, science, engineering and technology. It certainly seems to have succeeded in doing that and I’m truly grateful that Mr. Brent Percival of Auburn University (where this competition was held) called me up (out of the blue) one day earlier this year and asked if ISEC would be interested in participating. We did spend some of our funds on sponsoring this competition and a few more of our dollars on hand-outs (posters, business cards, CLIMB Volume 1 and the ISEC report on Debris Mitigation) and I think it was very well worth it. I had people talking to me almost the entire time I was there about the Space Elevator. People sure treat you nice when they find out you’re a sponsor :). I was given an ‘all-access’ pass and was able to go anywhere I wanted and talk to anyone I wanted. I made a point of introducing myself to the event announcer. When I found out that his son was very much into robotics and the idea of a Space Elevator, I made sure to give him a copy of CLIMB, an ISEC Report, all 4 years of posters that we have and a couple of years of Conference proceedings to give to his son. I wasn’t looking for any favors, just trying to get the word out, but boy, did ISEC get top billing whenever they thanked their sponsors! Every other sponsor was just mentioned by name. When he mentioned ISEC, he raved about how this group was really working on the idea / project of building a space elevator. I would say, with a very high degree of confidence, that fewer than 10 people at the event knew about ISEC when the event started. But by the time we were finished, I had people coming up to me to talk to me, people would point me out when I walked by, everyone would say “Thank you for helping out this event”, etc., etc., etc… We truly did get some excellent publicity at this event. There was just a lot on fun, techy-nerdy stuff going on too. Each of the teams could submit a short video which was then displayed several times during the competition – and a winner was chosen at the end of the competition. The winning video was a play on Star Wars, with the punch line being “May the Centrifugal Force Be With You” – I love it! But my personal favorite (which took 2nd place) was about how Thor was banished from Asgard by his father. Naturally, he landed in a Science Class and, after he told the students his plight, they built him a Space Elevator so he could return home – very creative. Each of teams had a mascot. There were robots (lots of different kinds), Sharks, Eagles, Tigers, etc., and, today, they held a “Dance-off” – again the top three each being awarded a prize. The audience really got into it (and so did the referees!). I took a video of the first round of competition, but didn’t post it as it did get a bit long. But the finals were short and fun and I’ve posted a video of that too. Sorry for the not-great quality. I tried to make my Canon point-and-shoot do double-duty (pictures and videos) and it just doesn’t do a great job on videos. But the final result was OK and I think you’ll enjoy watching it. And I’m also sorry that the song they danced to was “Gangnam Style” – it seems to be everywhere! I think that’s it. I do want to sincerely thank the BEST organizers and the Auburn staff, especially Mr. Brent Percival who invited ISEC to participate, for all their kindnesses – they truly showed what Southern Hospitality was all about and they ran a great competition. (The top photo thumbnail is of the representatives from Cornerstone, hoisting their trophy in triumph. Not great quality – taken on a camera phone so I could Tweet it right away. The bottom thumbnail is of my favorite poster at the event. Click on either to see a full-size picture and visit ISECdotORG on Flickr to see more photos from the Event). This entry was posted in News / Announcements, Space Elevator Competitions on December 3, 2012 by Ted Semon. 70 degrees today here in Auburn, Alabama. Sunny skies, very little wind – just a delightful day. So what am I doing? I’m inside all day watching the South Regional BEST competition! I’ve posted before about what BEST is, so will concentrate on today’s event in this post. Most of the day was setup and practice – actual competition didn’t begin until 5pm. These were preliminary, ‘seeding’ matches – 4 teams competed at one time, with the best 2 moving on to tomorrow’s finals. On the ISEC Flickr account, I’ve posted the best of the pictures I took today – more tomorrow, I promise. Also, I’ll have a video tomorrow of one of the competition runs. I captured one today but it turned out to be of very poor quality. Memo to self – don’t use the zoom feature of my Canon point-and-shoot when recording video. Each team was given a kit to make a climber out of. In this sense it is very similar to the LASER competition held by the Japan Space Elevator Association. The tether belt was shorter than the one at LASER – maybe 5-7 meters tall. There were various types of ‘payload’ that the Climbers had to grab and either go up the tether with it and put it in its proper location or else grab it from the top of the run and bring it back down to the bottom. The teams have 3 minutes to get as much payload moved as possible. The results of the competition are only one part of a team’s final score. The booth they had, the engineering project workbook they made and a few other items all were part of it too. The competition is really well organized. They have lots of judges and referees, teams are staged before they actually are let into the competition area, scores are kept electronically and, in general, it is a very orderly process. But it’s not quiet, oh no! Each team has a cheering section and it reminded me of a European Soccer match. Waving flags, chants, etc., and with music pounding in the background. Each team also has a mascot, so there were high-school kids dressed up as robots (many varieties), sharks, war eagles (the Auburn mascot) wandering around all day too, just to add to the festivities. As ISEC is a sponsor of this event, we have our logo in all of the literature and it is also shown on the Scoreboard over the Arena – the first time, I think we’ve been up in lights! I also have my own table where I spent a good part of the day hanging around. I brought several copies of CLIMB, the ISEC Report on Space Debris Mitigation, posters from all 4 years, some Conference proceedings and a few copies of the National Geographic that the Space Elevator and ISEC was featured in. And, oh yes, lots of ISEC Business cards. I only put out half of the material today which was a good thing, because by the end of the day it was all gone. I’ll hand out the rest of it tomorrow. It was also a lot of fun talking to the competitors, their teachers and their parents about the Space Elevator. Even with the cold I have, all in all, a great day. And, if you want up-to-the-minute information, follow us on Twitter and/or on Facebook at ISECdotORG! (Picture thumbnail is a close-up of one of the Climbers. Click on it to see a full-size version or visit our Flickr page (ISECdotORG) to see more photos). This entry was posted in News / Announcements, Space Elevator Competitions on December 2, 2012 by Ted Semon. There is never an opportune time to get sick, but here I am, with a cold, at the South’s regional BEST competitionin Auburn, Alabama. I’ve been very fortunate to have traveled to many, many places, both inside and outside the US, but I don’t think I’ve ever been to Alabama. Last night was my first experience with Chick-Fil-A and, I must say, the sandwich lived up to the hype. Competition doesn’t begin until 5pm today at the Auburn Arena. The time prior to that is setup and preparation and I’m looking forward to wandering around the arena, introducing myself (as much as my sore throat will let me), taking pictures and, in general, just soaking up the competition atmosphere. This entry was posted in News / Announcements, Space Elevator Competitions on December 1, 2012 by Ted Semon. 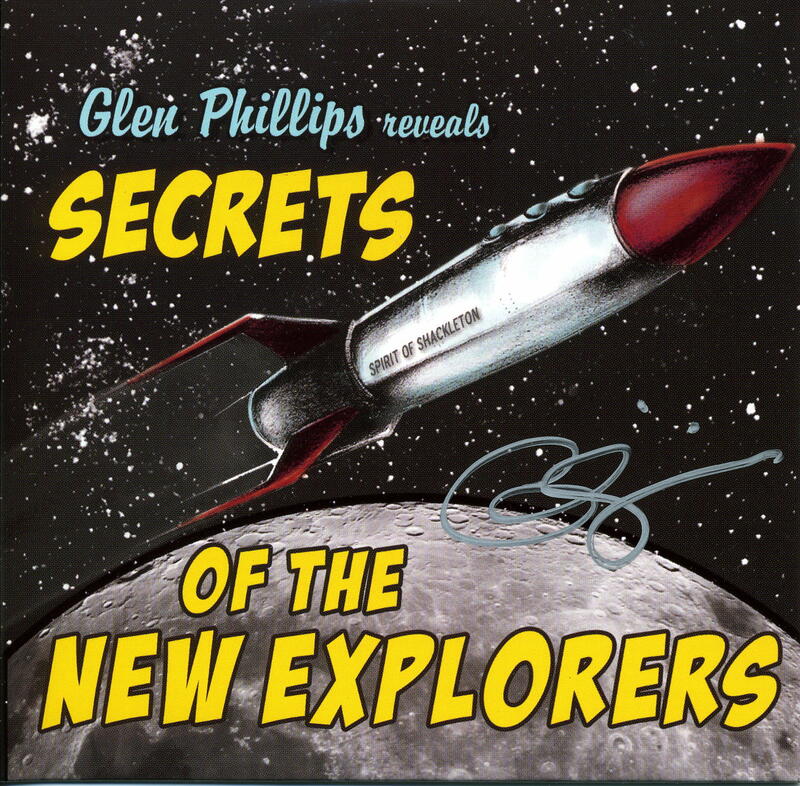 Followers of this blog and/or the Space Elevator Games are very familiar with the Kansas City Space Pirates. 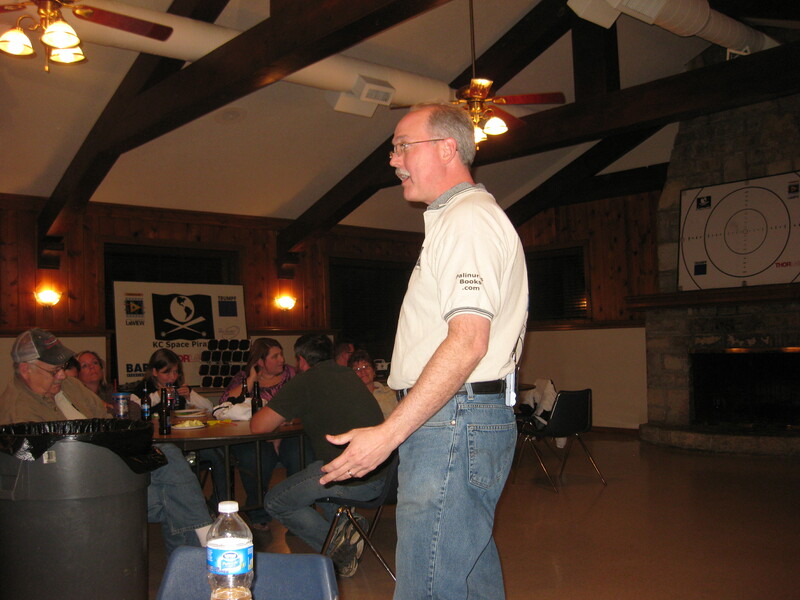 Captain Brian Turner and his fellow team members competed in several of the Space Elevator Games – Power Beaming competitions and acquitted themselves very well. This August the KC Space Pirates will take the next step in the development of laser powered flight and in the art of wireless power beaming. We will attempt to keep a one pound robotic aircraft flying for 2 full days (48 hours), nearly 4 times the previous world record…The date of this attempt is set to coincide with the International Space Elevator Consortium’s (www.isec.org) annual conference in August of this year. The current record is held by LaserMotive, also a veteran (and prize-winner) of the Power-Beaming competition. With NASA ending its support for the Power-Beaming competition, it’s good to see that the spirit of competing is alive and well. More to come soon – bring it on! This entry was posted in News / Announcements, Space Elevator Competitions on June 6, 2012 by Ted Semon. This coming August, the Japan Space Elevator Association (JSEA) will be holding it’s fourth annual JSETEC (Japan Space Elevator Technical and Engineering Competition). Each year, the JSEA gets more and more ambitious with its competition and this year, they are aiming for a racecourse more than a kilometer high! The next space elevator competition here looks like it will be the first week of August 8/1-8/5. We will probably have a narrower/thicker tether 25mm x 1.2mm, and plan to get up past 1km this time. There is quite a bit of activity due to the recent report from Obayashi Consortium that they plan to build a space elevator by 2050. If you are interested in participating, you can contact Devin directly at devinjacobson [at] jsea.jp. The JSEA also recently held a workshop for JSETEC, 2012. Previous posts about the 2009 competition here, the 2010 competition here and the 2011 competition here. There are also several other posts related to these games on this blog – just key in “JSETEC” in the blog’s search window to view them. Congratulations again to the JSEA – we look forward to an even bigger and better JSETEC this year! This entry was posted in News / Announcements, Space Elevator Competitions on March 26, 2012 by Ted Semon. In early August of last year, the Japan Space Elevator Association (JSEA) held their third annual JSETEC (Japan Space Elevator Technical & Engineering Competition) event. 16 teams competed in this event, an event that had, at the highest point, a nearly 600 meter long ‘race-course’. Just recently, JSEA posted their English-language version video summary of the competition. You can find it at this JSEA website page (the top version is in Japanese, the bottom one is in English). Seeing one of the JSEA competition Climbers catching fire brought back memories of the 2007 LaserMotive entry and the “smoke-filled room”. Watching the rain at the JSEA event reminded me so much of the rain and generally nasty weather at the 2007 NASA / Spaceward competitions held in Layton, Utah. When the tether broke at the 2007 Space Elevator Games, it was just replaced with more tether (and a prayer that it wouldn’t break). When the tether at the JSETEC games needed repairing, well, they repaired it. The video shot of the ‘many hands’ working on this was remarkable, truly. JSEA set up a wi-fi network connecting everything at their competition, including the end-point of the competition run. The Space Elevator Games didn’t do that, but for the 2009 competition, we had full use of all of NASA’s cameras and associated equipment to measure what had (and had not) been accomplished. The 2011 JSETEC competition was held at the “Osawa alluvial fan of Mt. Fuji” while the Space Elevator Games were held on the “Rogers Dry Lake” at the NASA-Dryden facilities inside the Edwards Air Force base. Two more different locales could not be imagined. You know, so many times you don’t appreciate what you have until it’s gone. I miss our power-beaming Games, I really do. This is a fine video – check it out. It’s 14 minutes, 25 seconds long and very much worth your time. And, for the next JSETEC competition, the Japanese aim for a height of 1,200 meters – higher than the winning run of the 2009 Power-Beaming competition. 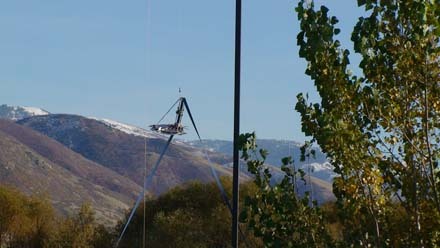 (Picture thumbnail is of the USST Climber and the tether which broke while they were attempting a Climb. Click on the thumbnail to see a full-size version of the picture). This entry was posted in News / Announcements, Space Elevator Competitions on March 4, 2012 by Ted Semon. Tomorrow, Friday, March 2nd, beginning at 1pm Eastern (10am Pacific), LaserMotive is hosting a Tweetup to mark their 5 year anniversary. 5 years. Geez. 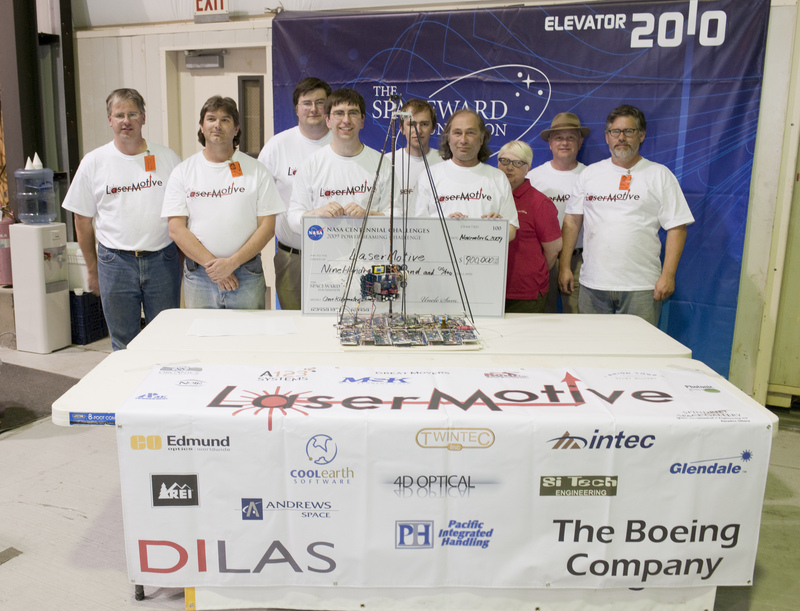 Lest anyone forget, this is the ONLY team that has won any prize money in the NASA / Spaceward Space Elevator Games. And, as a side note, though the NASA / Spaceward sponsored power-beaming competition seems to be ‘on hiatus’ as they say, I think the future of space-elevator related competition is bright (pun intended). So, get on Twitter tomorrow, and tweet Lasermotive @lasermotive. Feel free to send them questions or just say hello! Congratulations LaserMotive for reaching yet another milestone! This entry was posted in News / Announcements, Space Elevator Competitions on March 1, 2012 by Ted Semon. The 2011 Space Elevator Games – Strong Tether Challenge was held yesterday, August 12th, at the 2011 Space Elevator Conference. This competition is part of the NASA Centennial Challenges program, a program funded by Congress and run by NASA, with the purpose of fostering new technologies. Successful competitors are awarded prize money. For the Strong Tether Challenge, there is a prize pool of $2Million for any entry that meets all the benchmarks. NASA doesn’t run the competitions themselves. Instead, they partner with organizations who run the actual Games. These organizations set the rules (with NASA’s review and approval), they arrange the venue, they find the teams, etc. For the Strong Tether Challenge and the Power Beaming Challenge, the Spaceward Foundation is the organizing partner. These two competitions are packaged together by the Spaceward Foundation and labeled “The Space Elevator Games” as Power-Beaming and Strong Tethers are crucial components of building a Space Elevator. When the competitions are held, NASA sends a representative to judge the results and to make the final determination as to whether or not a prize will be awarded. This year’s strong Tether competition was held, as mentioned earlier, at the annual Space Elevator Conference. This is the third year that the competition has been held here and it seems to be a perfect venue. The facilities are absolutely first rate and there is already a gathering of space elevator enthusiasts and, this year, carbon nanotube (CNT) scientists and researchers. To actually test the tethers, you need a machine that stretches the tether to failure and records the value at which the tether broke. Spaceward built the machine that does this testing. A tether is mounted on the test rack. A hydraulic pump is then manually pumped, putting strain on the tether. When that tether breaks, the readout device shows the measurement of the level that the tether actually broke at. This measurement is then entered into a formula which also contains the length and weight values for that tether and final score is computed. If the score exceeds one of the prize benchmarks, then that tether is a prize-winner. Two teams competed this year. One was an individual and first-time competitor in the Strong Tether Competition, Flint Hamblin. If that name sounds familiar to you, it’s probably because he was part of team which competed in the Power-Beaming competition some years back. Flint has decided to go after the tougher nut to crack, making a strong tether. The second team was Odysseus Technologies, Inc – a team which also competed last year. Flint brought three tethers to the competition. Each tether was measured (weight and length), put on the test rack, and then stressed until they failed. 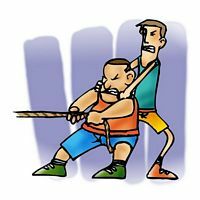 His first tether needed a score of 898 pounds, but broke at 153 pounds. The second tether needed a score of 948 pounds but broke at 264 pounds. The third tether needed a score of 452 pounds but broke at 154 pounds. The reason for the different metrics was that the tethers themselves were of different weights and length. The prize competition formula normalizes these measurements so that all tethers have an equal shot of winning. Flint’s tethers were made with off-the-shelf components plus some “secret sauce”. As a newbie in the competition, Flint stated he didn’t expect to win this year, but wanted some baseline measurements he can use to help judge future year’s results. The second competitor, Odysseus Technologies (headed by Dr. Bryan Laubscher), brought only one tether, but it was made out of carbon nanotubes. This tether however, broke at a very low level. It’s target score was 2,000 pounds, but it broke at just 11 pounds. This tether did not perform as well as the CNT tether that Odysseus brought last year, so obviously something adverse happened. Whatever it was, this means that we concluded another year of Strong Tether competition without awarding any prize money. However, hope springs eternal. Attending the conference this year were Dr. Vesselin Shanov and graduate student Mark Haase of the University of Cincinnati and Dr. Boris Yacobson and Dr. Vasilii Artyukhov of Rice University. They were very enthusiastic about what they saw and expressed a strong interest in having their departments work on competition entry. With the resources they have behind them, this should provide a quantitative leap in the entries for next year. (Picture thumbnails: Topmost is Sam Ortega, one of the NASA representatives attending the competition. Next is Ben Shelef, principal of the Spaceward Foundation. As part of his introductory speech, he is showing a piece of a cable we obtained from the Puget Sound Rope Company. Next is Flint Hamblin, showing one of his tethers. Fourth is the carbon nanotube tether from Odysseus Techologies. And last is a picture of the two competitors. Dr. Bryan Laubscher from Odysseus Technologies is on the left while Flint Hamblin is on the right. As always, clicking on any of the thumbnails will give you a full-size picture). This entry was posted in News / Announcements, Space Elevator Competitions on August 13, 2011 by Ted Semon. The first European Space Elevator Games (EuSEC) website now has a page devoted to the teams who will be participating. It’s good to see our friends from ETC (Earth-Track-Controllers) involved in this competition. They were great competitors and great sports at the 2007 Games held near Salt Lake city. This entry was posted in News / Announcements, Space Elevator Competitions on June 5, 2011 by Ted Semon. The Japan Space Elevator Association (JSEA) has announced the JSETEC2011 competition, to be held August 4th through the 8th. Details can be found on the announcement webpage. If, you’re like me and cannot read Japanese, open the page in Google Chrome and translate it to your language of choice. This is the third JSETEC (Japan Space Elevator Technical & Engineering Competition) event and I’m sure it will be the best, most ambitious one yet. Among other changes, they are increasing the height of the climb from 300m to 600m! In February, I had blogged about this competition, and included some videos that Mr. Shuichi Ohno, president of JSEA had sent me. Congratulations JSEA – we look forward to an exciting event! This entry was posted in News / Announcements, Space Elevator Competitions on May 17, 2011 by Ted Semon. A few days ago, I received an email from Franciska Volgyi, Technical & Organizational lead for EuSEC; Europe’s first Space Elevator Challenge. I had previously posted about this competition here. If you have any questions about this competition, you can email Franciska at “spaceelevator [at] warr.de”. Thank you Franciska – I think this is going to be great event and I sincerely hope my schedule will allow me attend! This entry was posted in News / Announcements, Space Elevator Competitions on November 10, 2010 by Ted Semon. This past Friday, I had the pleasure of attending the official Kansas City Space Pirates ‘closure party’, a party hosted by KCSP Captain Brian Turner. As I had posted earlier, KCSP has officially given up in their quest to win the NASA Centennial Challenge Power-Beaming competition (part of the Space Elevator Games). Brian rented out a community center in Kansas City and invited all team members and their immediate family (who, almost inevitably, got involved with the project too) to thank them for all of their efforts and to briefly review KCSP’s accomplishments in the three Space Elevator Games they competed in (2006, 2007 and 2009). Brian brought the optics box and climbers, as well as balloons for the kids. There was lots and lots of food, and enough beer and wine to go around (and a local police officer to make the alcohol officially legal). Brian’s speech was gracious and inclusive, and he singled out every person there, talking about what they had done and thanking them for their contributions. From Brian, I would have expected nothing less – he and the whole team was a class act and we are all sorry that they were not more successful in the Games. If anyone wants to pick up KCSP’s legacy and compete with LaserMotive in the future, please contact Brian (brian [at] kcspacepirates.com). I’m sure their equipment (especially their optics and climber) can be obtained for a reasonable price. But don’t wait too long as we’ll probably see bits and pieces of it up on Craigs List in the not-too-distant future. I’ve included thumbnails of a few photos I took at the party. 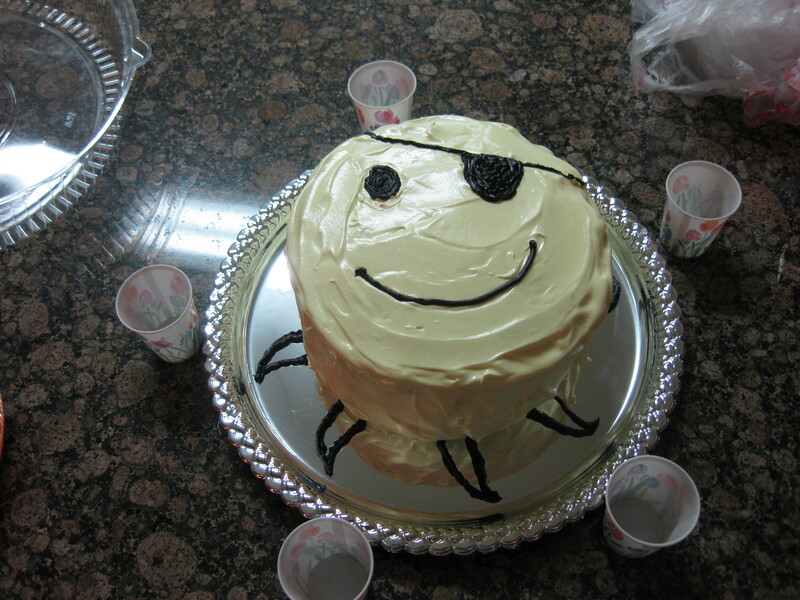 The topmost is of a custom-made Pirate cake that Bryan’s wife made. Very cool and very tasty. 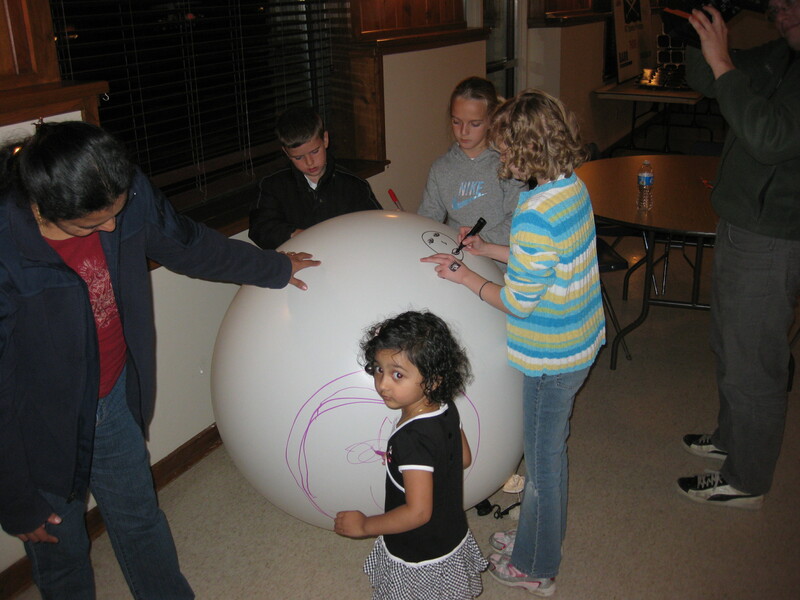 Next is a picture of some of the children at the party drawing on one of the big balloons that Brian brought. These are the same types of balloons that KCSP brought to the 2007 Games to use as ‘target-practice’ in sighting their mirrors. The third picture is of Brian in mid-oration. The last picture is of Brian, flanked by Dan (on the left) and Nic; the principals of the Chicago Video Production company, Bitter Jester Creative, Inc., the ‘chroniclers’ of the people-side of the Games. They are located in the Chicago area, as I am, so we all drove down to the party together. Nic and Dan took the opportunity to interview Bryan (extensively) and other attendees as part of their of project. I can’t wait to see the final result – they literally have hundreds of hours of footage and it’s going to tell quite a story. This entry was posted in News / Announcements, Space Elevator Competitions on November 7, 2010 by Ted Semon. On the USST website, they have a summary of their activities at the recent JSEA LASER competition as well as a couple of videos. I had previously posted about the climb where they crash-landed, but didn’t post the one where they did much better. And I had posted a wrap-up of the competition here. This entry was posted in News / Announcements, Space Elevator Competitions on October 24, 2010 by Ted Semon. EuroSpaceward announces EuSEC – the first European Space Elevator Challenge! Exciting news – EuroSpaceward has today announced EuSEC – the first European Space Elevator Challenge! This competition is being organized by WARR, the Scientific work-group for rocketry and space flight of the Technical University of Munich in cooperation with the Technical University of Munich, the Klaus Höchstetter Foundation, Lrt, the Institute of Astronautics and EuroSpaceward. The competition is scheduled to be held from June 10-12, 2011, with backup dates set as June 16-18, 2011, and the location will be in Germany at the campus of the Technical University of Munich – Campus Garching (Garching Forschungszentrum). Several prizes are offered, with the top prize being 2,000 Euros. Enquiries about the competition should be sent to Franciska Volgyi, the technical and organizational lead, or Andreas Fleischner, responsible for the SE agenda at WARR. Both can be reached at (spaceelevator [at] warr.de). Details about the competition can be found in this handbook. A competition flyer, a powerpoint presentation and poster have been created as well as a website for this Challenge. Mark your calendars – this should be a lot of fun! This now makes a total of five space elevator games / challenges now in existence. We have the two American Space Elevator Games (the Climber / Power-Beaming challenge and the Strong Tether Challenge), the two Japan Space Elevator Games (JSETEC and LASER) and now the European Space Elevator Challenge (EuSEC). I love it! Congratulations to WARR, the Technical University of Munich, the Klaus Höchstetter Foundation, Lrt, the Institute of Astronautics and EuroSpaceward for making this happen! This entry was posted in News / Announcements, Space Elevator Competitions on October 21, 2010 by Ted Semon. The risk/reward ratio is just no longer where it needs to be to make the power beaming competition worth our efforts. Without the TRUMPF 8 kw laser we have slim to no chance of beating LaserMotive. Lasers cost about $75,000 per kw. That makes the prize $333,000 and it will cost us $200,000 to make a credible run at that. I have said before that between 4 and 5 to 1 was the ratio that would get us to go for a competition. We have enough into the power beaming competition that I would be willing to lower that to as low as 2.5 to 1. We just are not close. But just because we lost does not mean we’re not pirates! What do pirates do when they get beat? Have a party. It’s just my way of saying thank you to all the people that have helped along the way. Oh, and there is that whole closure thing. We’ll have a bawl… er… I mean ball. It may turn into a roast Brian evening but that’s OK with me. So I am working up the invitation list now. If you think you should be on that list, drop me a line. A quick recap of what we accomplished. Three times over 5 years we turned in the second most exciting performance in a international high stakes NASA technical competition. We missed out on millions in prize money by slim margins and provided innovative solutions that the industry had never seen before. All of this on a budget that was from 1/2 to 1/4 that of the teams that managed to beat us. We raised over a quarter million dollars in sponsorship and funding. And put in over 4,000 hours of time. It was quite a ride! And because I don’t have a good way to invite companies to the ball I want to say thanks to them once again here. I also want to thank Tom and LaserMotive for being great competitors and the consolation prize arrangement that has let me keep my house. So, what can one say about the Kansas City Space Pirates? I think they were everyone’s favorite competitor. I think even the other teams wished that if they themselves didn’t win the prize money, they hoped that KCSP would be the ones to do so. Their work was so innovative and every member of that team was just a joy to be around. They certainly demonstrated the technical capability to win the prize, but they were always thwarted by the unexpected event. And Brian’s appearance on the Conan O’Brien show is a highlight that will live on in Space Elevator Lore. We at ISEC are collecting some items we’ll want to broadcast during the maiden run of the first Space Elevator and this Conan O’Brien show clip will certainly be one of them. So, major bummer. I have had several conversations with Ben Shelef about the future of the Climber / Power-Beaming competition and, while it is much too early for me to spill any of the beans, I can safely say that some significant changes in the structure of the Games appear to be in the cards. This entry was posted in News / Announcements, Space Elevator Competitions on October 20, 2010 by Ted Semon. Ben Shelef, CEO of the Spaceward Foundation, organizers of the Space Elevator Games, arrived in Seattle / Redmond today. He tells me that there will be at least two contestants, and possibly a third, in this year’s Strong Tether Challenge. All of the contestants are bringing entries made out of carbon nanotubes. This is über-mega-cool. In 2007, there was a single carbon nanotube entry from team DeltaX, a collaboration between MIT and Nanocomp. In 2009, there was another single carbon nanotube entry from Shizuoka University in Japan. Neither one performed very well. The Delta-X entry slipped at the knot tied in the loop (very high tech ) while the Shizuoka entry, a ‘tape’ formed from nanotubes held solely by Van der Walls forces, broke at a very low level. But that was the past and this is now the future. With two, maybe three entries, we could see some very good performances. The lack of a material strong enough is the single biggest obstacle in the way of building a Space Elevator. Having some sort of breakthrough demonstrated at this year’s Space Elevator Games – Strong Tether Challenge would be nothing short of monumental. Plus, if there are any winners, there is a cool $2 Million dollar prize purse, courtesy of NASA, to be awarded. So, stay tuned. Despite a last-minute glitch, we’re still hopeful of broadcasting the competition live on uStream. Details will be posted here (and on Twitter) as soon as they are available. This entry was posted in News / Announcements, Space Elevator Competitions on August 12, 2010 by Ted Semon. The Strong Tether challenge, part of the Space Elevator Games, is just three days away! It will be held at the upcoming Space Elevator Conference, on Friday, August 13th. This challenge is part of the NASA Centennial Challenge program and is administered by the Spaceward Foundation. Oh, and by the way, NASA has provided a $2 Million dollar prize purse for this competition, just like they have for the Climber / Power-Beaming competition. This year it looks like we may may have multiple entries – the first time that’s happened in a few years. But we’re only going to know for sure at the competition. For up-to-the-minute information and status, subscribe to our Twitter Feed “SEGames”. And, if all works according to plan, we’ll be broadcasting the competition live over the Internet via uStream. Details will be posted here and on Twitter. I know that the Climber / Power-Beaming Challenge is the ‘sexier’ of the Space Elevator Games, but IMHO, the Strong Tether Challenge is the more important one. No one in the know seriously doubts the ability to beam power over distance and then do something useful with it (though the devil is always in the details and I’m certainly not saying it is easy – look how long it took a team to actually win some prize money in this challenge), but creating a fundamentally stronger material is more than an exercise in ‘simple’ Engineering – it requires a real scientific breakthrough – and this breakthrough is required if we’re going to build an earth-based Space elevator someday. If someone can win the challenge this year at the Space Elevator Conference, the year that Yuri Artsutanov and Jerome Pearson attend, well then I think it will be safe to say that Gods want a Space Elevator to be built. This entry was posted in News / Announcements, Space Elevator Competitions on August 11, 2010 by Ted Semon. The dust has settled from the failed attempt to schedule the games for this fall. I will give a recap of how we got here. A few months after the last games USST was informed that they would not be allowed to enter the games this time around. Turns out that the prize monies are reserved for US citizens. This was not a new rule but how would you tell a US team from a non US team? The rules said that the team captain had to be a US citizen. USSTs official captain was just a figurehead to meet that requirement. I will let you decide for yourselves if this is all fair or not. Personally I would rather compete to be the best in the world. I do however have a bias. The KC Space Pirates were sharing laser expenses with USST. Also the cost of running the competition is divided among the teams. With USST gone our costs jump by $30,000 to $50,000. That was more than I thought we could handle. With only 1 competitor there really is not a competition. So the competition was delayed to give USST time to figure out a way. A wide array of options were explored. In May USST dropped out graciously. The costs were just too high. I asked Spaceward to work on lowering the costs. A new venue was found up in Washington state that was close to the helicopter. This would lower costs significantly. Spaceward got a preliminary OK from the venue and I set about raising the funds needed. Amazingly I got pledges for the more than $50,000 we needed in just 2 weeks. But the time needed to find the venue and raise the money left little lead time for everything else to come together. We needed official approval from NASA the venue and TRUMPF to proceed. An unfortunate snag was hit causing another 2+ week delay in the process of getting all the paperwork together and that was enough to push past fall and into winter. It’s not prudent to hold an outdoor event that requires mild weather in the winter in Washington state. So that leaves us with Spring 2011. But there is still a cloud of doubt over the competition. Most of the pledges I received were conditional on fall 2010. So I still don’t know if we can raise the money and I don’t know if TRUMPF will still be willing to provide a laser. We also don’t know if even LaserMotive will stick around that long. What we need is a few more teams to enter the competition. That will lower the costs and put the predictability back into the competition. This has put me in the rather odd position of trying to recruit teams to compete with us. The threat of winning less money is balanced by the high cost of raising the money needed without additional teams. I am even going so far as to offer help to new teams to help them up the steep learning curve of the competition. This offer is in exchange for a cut of their prize. Remember, we are pirates after all. The altruistic motivations that provided the resources to run the competition in the past are substantially less this round. Mainly because the success of the competition has shown that power beaming works largely as predicted and is only currently practical for a few applications. The big motivators of cheap Space Access and the Space Elevator are firmly located in the future world of better lasers and bigger budgets. I think that both of those are coming. But without new teams bringing in new innovation and resources the competition may not happen at all. So the KC Space Pirates are on a recruiting drive. If you think you have what it takes, want to go where few have gone before, and have at least some kind of budget, contact me. So, the gauntlet has been thrown – any takers? This entry was posted in News / Announcements, Space Elevator Competitions on August 9, 2010 by Ted Semon. In May of 2008, I posted about a DVD-story that had been created about Team Astroaraneae – a group of people that had entered into the first two Space Elevator Games – Strong Tether Competition. This DVD, entitled the “Mighty Tether” is now available in 5 parts on YouTube. Here’s to a successful 2010 Competition! This entry was posted in News / Announcements, Space Elevator Competitions on August 7, 2010 by Ted Semon. I received word yesterday from Ben Shelef, CEO of the Spaceward Foundation (the group that organizers the Space Elevator Games) that this year’s Power-Beaming competition has been postponed until March/April of next year. The Strong-Tether portion of the Space Elevator Games is still scheduled to be held at the upcoming Space Elevator Conference. As more news becomes available, it will be posted here and at the official site of the Space Elevator Games. This entry was posted in News / Announcements, Space Elevator Competitions on July 21, 2010 by Ted Semon. I’ve written about the NASA MICI (NASA Minority Innovation Challenges Institute) before (here), telling you all about a video which had been posted on this website. This video showed portions of the competition in several of the recent NASA Centennial Challenges. That’s all well and cool, but Ben Shelef, CEO of the Spaceward Foundation (organizers of the Space Elevator Games) has just let me know that, at the NASA MICI channel, “June is Space Elevator Month“. Two presentations relating to the Space Elevator Games have already been posted and two more are on the way. And, if you login to the site while a presentation is underway, you’ll be able to interact (via Chat) with the presenter, asking questions in real-time. The ‘catch’ to all this is that to register to view these presentations, you must be a professor that is “…currently employed at a university or college located in the United States” or a student that is “…(a) a US Citizen currently enrolled at a university or college or (b) a non-US Citizen who is currently enrolled at a university or college located in the United States. ” If you don’t fall into either of these categories, you can apply for login permission (you’ll see how to do this on their website). This site and it’s videos are there to encourage participation by US students and faculties in the NASA Centennial Challenges program. If you qualify (i.e. are a faculty member of student meeting the MICI requirements), then I would highly encourage you to sign up for this. We are always looking for more competitors in the Space Elevator Games and the majority of teams that have registered have been university-based. The more the merrier! This entry was posted in Interviews / Presentations, News / Announcements, Space Elevator Competitions on June 19, 2010 by Ted Semon. Just a case of the rich getting richer… Team LaserMotive, winners of a cool $900K in last year’s Climber / Power-Beaming portion of the Space Elevator Games, has acquired some new sponsors in its attempts to collect the remaining $1.1M in the NASA-provided prize pool. This is just going to make them an even more fearsome competitor in the upcoming competition. Congratulations again to LaserMotive! This entry was posted in News / Announcements, Space Elevator Competitions on June 17, 2010 by Ted Semon. 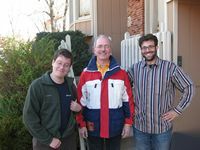 Many moons ago (Dec 28, 2007), Stan Taylor of the Science Teachers Association of Ontario did an interview with Clayton and recently, he kindly emailed it to me. You can read the interview here (it’s in pdf format). It’s very interesting and we learn all sorts of interesting facts about Clayton. For instance, he is a Canadian and, when he was younger, he played hockey – what are the odds? STAN FREBERG: …ahem, okay people, now when I give you the cue, I want the 700 foot mountain of whipped cream to roll into Lake Michigan, which has been drained and filled with hot chocolate. Then the Royal Canadian Air Force will fly overhead towing a 10-ton maraschino cherry, which will be dropped into the whipped cream to the cheering of 25,000 extras. All right – cut to the mountain! Now, you want to try that on television? This entry was posted in Interviews / Presentations, News / Announcements, Space Elevator Competitions on June 16, 2010 by Ted Semon. Recently posted on the NASA MICI (Minority Innovation Challenges Institute) website is a short video showing portions of the competition in several of the recent NASA Centennial Challenges. The Power-Beaming competition is shown, of course, with the 2009 prize-winners, LaserMotive, as the representative. If you visit their photos/videos page, you can see several other cool things worth watching. Hat-tip to the LaserMotive blog posting which alerted me to this. This entry was posted in Interviews / Presentations, News / Announcements, Space Elevator Competitions on May 13, 2010 by Ted Semon. This entry was posted in News / Announcements, Space Elevator Competitions on March 25, 2010 by Ted Semon. As I posted several days ago, a gathering was recently held in Washington DC – a gathering of NASA people involved in the Centennial Challenges program (of which the Space Elevator Games are a part) and most/all of the recent organizers and competitors from the recent competitions. Team LaserMotive arrived in force and a post about the trip is now on their blog. This entry was posted in News / Announcements, Space Elevator Competitions on March 10, 2010 by Ted Semon. Check out this page to view them. All of them are of the very high quality that we have come to expect from this talented and dedicated group. I sent you the crane building vid for your enjoyment but I thought I’d let you know that I added that clip (with a nicer fade at the start) and two others (one that you’ve seen, where Ben explains the space elevator on the white board and another new one … UBC delicately polishing their solar cells before the wind whips their climber around) to the BJC site as well. The title of this post was a quote from Ben Shelef (in the video clip ‘Building the crane‘) talking about how the redesign of the raceway would, hopefully, dampen the oscillations in the tether caused by the wind. Alas, this tether failed during the competition (described here and here) due to those pesky oscillations, and was a primary reason why Ben moved to a steel cable (which performed spectacularly well) in the 2009 Games. This was just one of those things that you don’t know if it’s going to work or not until you try it. Watching these clips of the 2007 Games brought back a lot of memories – most of them good, but some of them sad. The weather really was a handicap in this event; lots of rain, lots of wind and even some snow and hail for good measure. I enjoyed watching all of these videos, but the one showing the UBC Climber was, IMHO, particularly fascinating. At the end of the clip, you can see how the wind just played havoc with everything, the tether and the climbers. The picture thumbnail of the UBC Climber, reflected off of their gigantic mirrors, was truly a video highlight of the Games. Click on the thumbnail for a full-size version of the picture. This entry was posted in Interviews / Presentations, News / Announcements, Space Elevator Competitions on March 2, 2010 by Ted Semon. 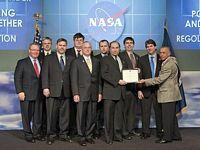 WASHINGTON — NASA will honor the achievements of the 2009 Centennial Challenges prize winners and competition hosts with a technical symposium Feb. 25 and a recognition ceremony Feb. 26. 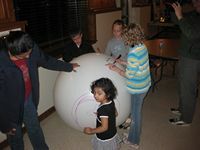 Centennial Challenges is NASA’s program of technology prizes for the citizen-inventor. Nine prizes totaling $3.65 million were awarded in 2009. Both events will be held at the James E. Webb Memorial Auditorium at NASA Headquarters, 300 E Street, SW, Washington. The Centennial Challenges Technical Symposium will take place from 9 a.m. to 4:30 p.m. EST Thursday, Feb. 25. Winners will discuss their accomplishments and future plans and answer questions from the audience. A one-hour panel discussion will be dedicated to each of the challenges, including the new Green Flight Challenge and ongoing Strong Tether and Power Beaming Challenges. The public is invited, and government, industry and media representatives interested in the technologies and incentive prize competitions are encouraged to attend. The recognition ceremony will begin at 10 a.m. on Friday, Feb. 26. NASA Administrator Charles Bolden will participate, as will winners of the Regolith Excavation, Lunar Lander, Power Beaming and Astronaut Glove Challenges. Reporters will have an opportunity to talk with the winners during a reception in the NASA Headquarters West Lobby immediately following the one-hour ceremony. The competitions address a range of technical challenges that support NASA’s missions in aeronautics and space with a goal of encouraging novel solutions from non-traditional sources. The partner organizations that conducted the competitions are: California Space Education and Workforce Institute (Regolith Excavation), X Prize Foundation (Lunar Lander), Spaceward Foundation (Power Beaming and Strong Tether), Volanz Aerospace Inc. (Astronaut Glove) and Comparative Aircraft Flight Efficiency Foundation (Green Flight). NASA’s Innovative Partnerships Program manages the Centennial Challenges. Unfortunately, it doesn’t seem to have made their podcasts. Ben Shelef of the Spaceward Foundation (organizers and hosts of the Space Elevator Games) attended as well as team members from LaserMotive and the Kansas City Space Pirates. LaserMotive blogged about attending this event (which you can view here). There have been some articles in the press about this – one of them can be found here. I talked with Ben about the meeting and he said that it was quite good and had exceeded his expectations. I hope to get a more complete summary of the meeting in the near future from him and/or some the attending team members. This entry was posted in News / Announcements, Space Elevator Competitions on February 27, 2010 by Ted Semon. This is one of those newsletters where I mostly have bad news. It looks like the competition date of May 10th is coming unstuck. We don’t have a new date at all right now which is just as well because once you miss one date then there is a pretty good chance that you will miss another. So a little time to make sure that the new date is firm is good. The helicopter has a hard time lifting the cable on the hot days of summer in the desert. Perhaps we can use a lighter cable now that we know how all of that works, I will have to look into that. If not, then we have to pick a different location for the competition or wait till Sept. I don’t have the resources to keep this as a priority in my life for that long and neither do my teammates. That means that our competitors will have an opportunity to gain on us if they spend a lot more time between now and then. Seems that Lasermotive has used the proceeds from their last win to take two team members full time. I expect a highly professional, polished system from them in the next round. I always knew that once a team won that they would be more difficult to beat the next time around. The trip to Photonics West went well but did not yield any leads for new sponsors. That means that it will be back to my private supporters to try and raise the money for this next round. That water well is pretty low after 4 years and no wins. So where is the good news? I have been spending a lot more time with the family and my regular customers are keeping me as busy as ever with my day job. So I can afford to wait even if it is rather annoying. And we have a list of tests to perform to try and tuneup the performance of our current system. I will update you if things change. This entry was posted in News / Announcements, Space Elevator Competitions on February 10, 2010 by Ted Semon. Well I am off to Photonics West. This is the trade show where just about all of my sponsors have a presence. I have been invited to do a poster presentation on Tuesday evening. It should be a good opportunity to talk with other people in the profession. Kind of interesting how this all went from “game” and “hobby” to “profession”. Anyway. We need to raise about $40,000 to cover all of the expenses for the competition. And if we want to upgrade to premium solar cells we need another $80,000. I am not holding my breath for the $80,000. The up side is that the competition has established itself as a draw for fans and viewers with over 25,000 surfing to the online video feed. Several dozen articles on numerous web sites and coverage on FOX news as well as other TV stations. So now we need to connect the sponsors to the audience. This entry was posted in News / Announcements, Space Elevator Competitions on January 22, 2010 by Ted Semon. A few weeks ago, Brian Turner (captain of the Kansas City Space Pirates – KCSP) sent out this email to his mailing list. This email, detailing “What Went Right”, is a follow-up to his “What Went Wrong” email I posted here. In my last email I talked about what went wrong. In this one I will cover what went right. The glass is half full point of view. Sorry if I get a bit technical. And I must point out that all numbers are estimates. Keeping all the power of the laser on target is no small task. We were the only team with a fully functional and automatic tracking system. The performance was spectacular. We were able to keep the laser on target 99.99% of the time for the first 500 meters. That performance dropped to 99.7% or so from 500 to 700 meters. At that point the .3% was driving our motor controller and power tracking nuts. This was markedly better than the manual tracking that the other teams were using. USST’s automated systems were down. Probably because of the same radio interference issues that we were suffering from. LaserMotive was using manual tracking that utilized 2 expert video game players with lots and lots of practice. Some time ago I had estimated that the cable would not be as stable as it was and that manual tracking was at the edges of human ability. So I was wrong in that the cable was really very docile. But I was right in that it is at the edge of human ability as Lasermotive was only able to keep it on target about 93% of the time from what I could see in our tracking camera. We do still have room for improvement here and I already know ways to make it better. I will be talking to National Instruments about a bigger and faster FPGA processor in our Compact Rio so we can improve the tracking even further. All three of the top teams did well in creating a competitive optics system. One that could handle the power while directing it quickly and accurately. This was however a major stumbling block for the teams that did not qualify. I would like to thank Thor Labs for providing the bulk of the high quality components needed to pull this off. Our climber was 1.2 Kg with payload vs 8.8 for USST and 5.4? for Lasermotive. We were less than 1/4 the weight of our nearest competitor. The climber was also simpler. We were the only team willing to run without added structure to save the climber from damage from landing mishaps. I suspect that we will be seeing lighter climbers from the other teams in the next round. We had a peak power transfer of 190 watts. For our lightweight climber that is enough to do 5 m/s. In our field testing we had power conversion of more than 200 watts at the full Km distance. LaserMotive had a peak of 1000 watts in the competition. USST was boasting 1200 watts at 800 meters in their testing. This puts us at just under 1/5 the power levels of our competitors. What is impressive is that we are in the hunt with them using only 1/5th the power. The reason for this disparity is the cost of the solar panels. USST commented that their panel cost $120,000. That exceeds our entire cash budget. We do get over that number counting Sponsors like TRUMPF, but clearly our competitors are much better funded than us. LaserMotive is using experimental cells that have no price on them. I would estimate that they are around $60,000 in value because they are less exotic than USST’s cells. Our cells cost less than $4000 per climber. I think this illustrates that no team does more with a watt or a buck than we do. Although we can probably eek out a 5 m/s run with our current system we clearly can’t be competitive with the power levels of the other teams using our current PV(solar) panels. We also crossed the finish line running well into the red on our finances. Although I have seen a few ideas that might have potential, I have to assume that there are no silver bullets to give us $75,000 PV panel performance from $4,000 panels. I had “The Talk” with my wife and she pointed out that the basement is full of this stuff, either sell it or use it. With the usual provisions about not losing any major items the house or cars. I really love how understanding she is. So now I need to talk with the team and work out details with them. Then I need to switch to fund raiser mode and raise enough to buy and build the PV panel that we need to be competitive. So if anyone knows a company that would like to sponsor a high profile, underdog, high tech team, be sure and let me know. This entry was posted in News / Announcements, Space Elevator Competitions on December 10, 2009 by Ted Semon. Here is the latest video from Ben Shelef, CEO of the Spaceward Foundation – organizers of the Space Elevator Games. The video clip tries to capture the scope of the project, and is dedicated to everyone who helped make it happen. This clip was officially unveiled at the just-completed EuroSpaceward conference in Luxembourg. This entry was posted in News / Announcements, Space Elevator Competitions on December 9, 2009 by Ted Semon. On the LaserMotive Blog, mention is made of a recent article in the SunBreak, a local Seattle newspaper (team LaserMotive is based in Seattle). It’s a very interesting article and well worth the read. LaserMotive’s Jordin Kare talks about power-beaming and why that interests LaserMotive (as opposed to a Space Elevator, which they are not interested in). This entry was posted in Interviews / Presentations, News / Announcements, Space Elevator Competitions on November 29, 2009 by Ted Semon. And, rounding out the post-competition analyses (KCSP is here and USST is here) , LaserMotive’s Steve Burrows gives us his team’s take on the recently completed competition. Congratulations again to LaserMotive and, indeed, all the teams for providing us with an extremely competitive and enjoyable three days. Only 169 more days until the 2010 Games! This entry was posted in News / Announcements, Space Elevator Competitions on November 22, 2009 by Ted Semon. On the first day of the recently completed Space Elevator Games, there were several reporters and cameras (still and video) at the ISF (the conference center where Bryan and I did the first two days of live coverage of the Games over uStream). One young lady was from ABC, another from AP and still another from Fox News. I didn’t see a whole lot of coverage from ABC (but I’m still going through video clips) and the AP reporter somehow carried away the ‘fact’ that there was a team ‘from Alaska’ that was competing (that was funny – after that report went out, I got calls from two local reporters in Alaska wanting to know how to contact the ‘local team’). This entry was posted in News / Announcements, Space Elevator Competitions on November 21, 2009 by Ted Semon.